A plastic explosive equivalent to 2.2 pounds of TNT tore through a crowded market in central Russia on Friday, the ITAR-Tass news agency reported, and the Emergency Situations Ministry said eight people were killed and 37 were wounded. Emergency workers had initially said the midday blast at the Kirov market in Samara, some 500 miles southeast of Moscow, was due to the explosion of two gas canisters used for cooking, and they ruled out foul play. ITAR-Tass, however, quoted Samara regional prosecutor Alexander Yefremov as saying that the explosive contained 2.2 pounds of plastic explosive. It also quoted witnesses as saying they could smell gunpowder — a sign that the blast may have been caused by explosives. Prosecutors opened a criminal investigation on charges of terrorism and murder, ITAR-Tass reported, but officials did not say whether they suspected political terrorism or a business dispute was behind the blast. "The explosion was very powerful, and the place was packed with people," said Timofei Zakharchenko, a spokesman for the Samara branch of the Emergency Situations Ministry. He said eight people were confirmed dead and 37 were injured. The Interfax news agency said a higher toll cited earlier by news agencies was due to the fact that some victims had been counted more than once in the confusion following the blast. Other emergency officials in the city told The Associated Press earlier Friday that the gas canisters had exploded accidentally while being used to cook food at an outdoor eatery. Russian state television showed pictures of bloodied bodies covered with plastic tarps, surrounded by debris. The blast ripped apart corrugated metal kiosks used as market stalls. The explosive was placed on the back wall of one of the kiosks, ITAR-Tass said. 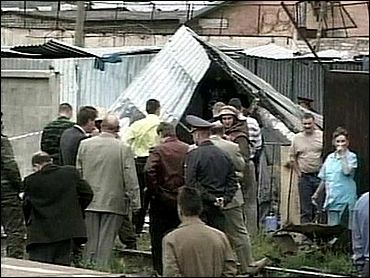 Interfax said that the epicenter of the explosion was near a railway that ran alongside the market. Gas canisters are widely used in Russia at outdoor markets and street food stalls, and explosions are common. Four people were killed in an explosion of canisters in March in the Siberian city of Omsk and a May 2003 blast in Moscow killed one and shattered the outdoor terrace of a restaurant.